Gold-Bar Feed Supplements LLC is a joint venture established in 2012 between Animal Feed Supplement, Inc and Gold River Feed Products, operating in Shelbyville, Tennessee, manufacturing Megalix feed supplements. Megalix supplements are produced through a Thermo-cured™ process that results in a nutrient dense block supplement that is weather resistant and provides predictable and consistent consumption rates. They are specially formulated with multiple protein sources to help enhance forage digestion and reproductive performance. 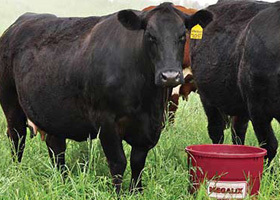 Megalix is an economical supplement with consumption rates that range from one to two pounds per head per day. In 2017 construction began on a low moisture feed block plant alongside the existing plant, with commissioning expected by early 2018.